WASHINGTON – The Department of Commerce's National Telecommunications and Information Administration (NTIA) today released a new report taking a first look at data collected through the Internet Usage Survey of more than 50,000 households, commissioned by NTIA and conducted by the U.S. Census Bureau in October 2009. Since 2007, the data show that while virtually all demographic groups have experienced rising broadband Internet access adoption at home, historic disparities among particular demographic groups overall continue to persist. "Broadband Internet access is critical to creating jobs in America, improving our global competitiveness, and enhancing our quality of life," said Assistant Secretary for Communications and Information and NTIA Administrator Lawrence E. Strickling. :While it is encouraging that Americans across virtually all demographic groups and geographic areas are using broadband at higher rates than ever before, a significant portion of the population is still not online. Through Recovery Act funding and other initiatives, the Obama Administration is working to close this gap and help create economic opportunities for more Americans. The survey data we are making available can not only inform these efforts, but it also can be useful to the broader research community working to address the digital divide." 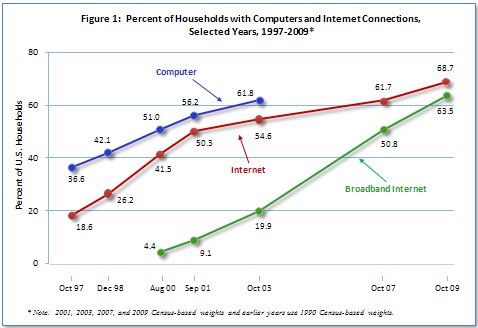 Broadband Internet access at home continues to grow: 64 percent of households have broadband access compared to 51 percent in October 2007.
Notable disparities between demographic groups continue: people with low incomes, seniors, minorities, the less-educated, non-family households, and the non-employed tend to lag behind other groups in home broadband use. While the digital divide between urban and rural areas has lessened since 2007, it remains significant. In 2009, two-thirds (66 percent) of urban households and only 54 percent of rural households accessed broadband Internet service, compared to 54 percent of urban households and 39 percent of rural households in 2007. Overall, the two most commonly cited reasons for not having broadband Internet access at home are that it is perceived as not needed (38 percent) or too expensive (26 percent). Besides these value and affordability concerns, Americans also cite the lack of a computer as a major factor. In rural America, however, lack of broadband availability is a more frequently-cited major reason for non-adoption than in urban areas (11 percent vs. 1 percent). Americans who do not use the Internet in any location most commonly cite insufficient value, or no need, as the reason. In contrast, households that have dial-up access to the Internet as well as households without any type of Internet access at home most frequently cite cost as the reason they do not have broadband access at home. Despite the growing importance of the Internet in American life, 30 percent of all persons do not use the Internet in any location. This report is based on the first data sets released by the Census Bureau, which is available to the public through http://www.data.gov. In the coming months, the Census Bureau will provide NTIA with more geographically and demographically detailed data.